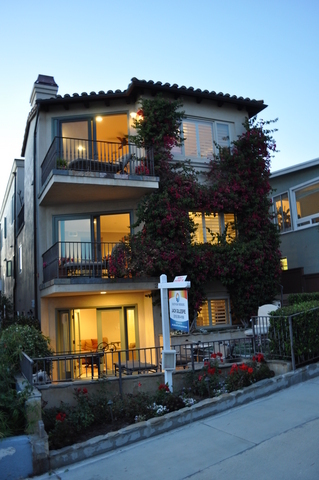 Located in the exclusive Manhattan Beach sand section, this stunning walk street home boasts supreme elegance in every way. With 4 Beds, 4.5 Baths and over 4,200 sq. ft. of living space, this home includes a gourmet kitchen with an island, Santa Sicilian Granite counter tops, Sub-Zero Refrigerator/Freezer, Thermador Appliances and Viking Stove top, Formal Dining Area, Living Room and Family Room, 3-stop elevator, Bonus Room and Pecan Hardwood floors throughout. 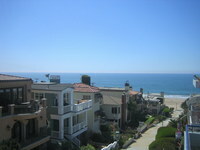 Enjoy the breathtaking ocean views from all 5 balconies that this property offers. Once you enter the Master Suite you will find a deluxe home office, with custom built cabinets and desk, through the Master Suite you will find a custom fire place and luxurious deck facing the walk-street with ocean view. The Master bathroom features both a spa tub and shower, double sinks with marble counter top and an over-sized walk-in closet providing ample space. Sitting on a lot with over 2,700 sq. ft. this custom built Ken Johnson Development beach home emphasis both luxury and elegance with its architectural design and attention to detail through-out, This home is a dream come true.